Rattan Coco Cone Hanging Basket 12"
Home > PLANT CONTAINERS Iron, CocoMoss, Rattan, Willow, Naturals, Bamboo and more. 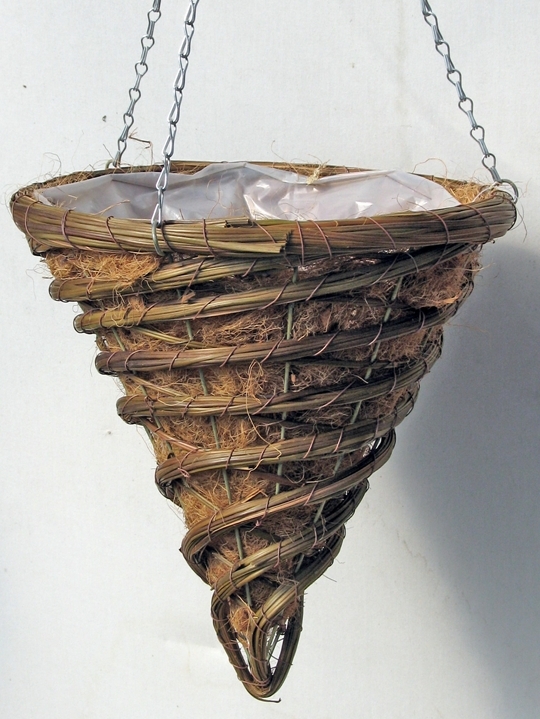 > COCO BASKET - PRO GROW - THE BEST ON THE MARKET > Natural rattan hanging basket planters > Rattan Coco Cone Hanging Basket 12"
This super deluxe hanging basket is built on heavy duty wire basket. Thin layer of CocoMoss is wrapped around the wire basket and next colorful rope of young rattan is attached to the wire basket creating artistic piece. Each basket comes with full poly liner for moisture retention. 12" top diameter and 14.5" depth. Standard chain hanger included. Wire hanger on request available.